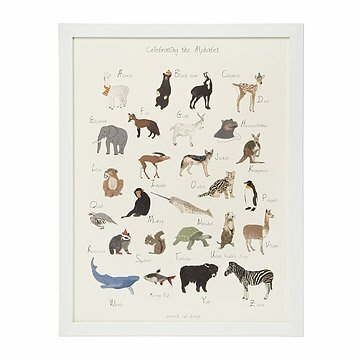 Celebrate the alphabet in nature-inspired style with this print by Jacqueline Schmidt. Blending the urban and natural worlds, Brooklyn artist Jacqueline Schmidt uses her signature quirk to create whimsical worlds where wildlife lives amidst our own modern luxuries. Enigmatic animals seamlessly blend with the imagined world around them, creating a charming and vibrant juxtaposition. In Celebrating the Alphabet, Schmidt uses her iconic species sketches to illustrate the ABC's of wildlife. From alpaca to zebra, even the myth-worthy narwhal earns a spot on this beautifully rendered list of intriguing alphabetical animals. Made in Brooklyn. Comes ready to hang mat and framed in white BonanzaWood frame. How can you go wrong with cheerful animals in hats. It is the best.